“Tommy Turtle Visits the Eye Doctor” follows a young turtle named Tommy and his friends at school. The author hopes to inspire children by sharing themes about friendship and acceptance through Tommy the Turtle’s little journey. Raiford H. Adams Jr. brings a poignant tale that reminds each reader how anyone can achieve great things as long as they put their mind to it. His little tale of courage also emphasizes that sometimes, not everything is always what they seem. He reminds them that overcoming one’s fear is always possible and as it happens, one can bravely conquer anything. In “Tommy Turtle Visits the Eye Doctor,” the short tale begins with Tommy the Turtle finding out that he needs to go the eye doctor for help. Other animals were teasing and laughing at him at school after he came to class with his new glasses on. After becoming upset with being teased, Shirley the Squirrel reassured him that it is alright and that he gets to learn the lessons better with his glasses on. In the end, everyone who teased Tommy learned the importance of always being kind to others. Indeed, Adams’ short story is an inspiring read for the young ones and the young at heart. Learn the value of acceptance, friendship, and overcoming one’s fear through Tommy the Turtle’s little tale so be sure to grab a copy! Hoping to reach out to a wider audience, “Tommy Turtle Visits the Eye Doctor” joins the upcoming 2018 Frankfurt International Book Fair this coming October 10-14, 2018. Written by: Raiford H. Adams Jr. Published by: Page Publishing, Inc.
Raiford H. Adams Jr. was born and raised in Texas. He has always had a passion for writing. 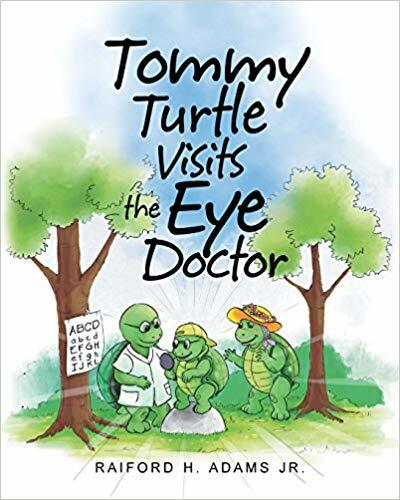 “Tommy Turtle Visits the Eye Doctor” is his first published work. He desires to help people live better lives by writing stories which show things are not as scary as they seem. Raiford hopes his book will help children learn that when they overcome their fears, they can do almost anything they set their minds to.